The Rafflesia by MK Land. MK Land Holdings Bhd plans to transform Damansara Perdana in Petaling Jaya into a more high-end area by focusing on building luxurious landed properties in a location known predominantly for its high-rise condominiums. Chief operating officer Fatimah Wahab tells StarBizWeek through an e-mail recently that the company will be pushing for more high-end residentials after receiving positive feedback from buyers of The Rafflesia that they would like to see more landed units. 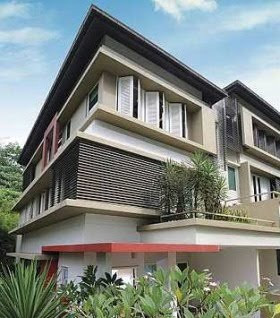 The Rafflesia, which offers modern contemporary three-storey semi-detached houses tucked in an exclusive enclave within Damansara Perdana, is the first landed property in that location. “We are confident that the demand for landed property in Damansara Perdana is increasing. This is based on the great respond we had with Rafflesia,” she says. The company sold 84% of its units within two days when it held a second launch of Rafflesia recently. With a built-up area of between 3,861 sq ft and 4,668 sq ft, prices start from RM1.4mil. The company expects to attract high net worth owner-occupiers, existing MK Land buyers as well as foreigners from Japan, South Korea and Australia. “Apart from high-end products such as The Rafflesia, our investors have also shown interest in our service apartment development, Metropolitan Square Residences. That project is about 65% sold. Prices range from RM250,000 per unit,” she says. The core products for MK Land are The Rafflesia, Armanee Terrace condominiums and Metropolitan Square (block C) condominium. They are expected to enhance profitability under the developer’s five-year roadmap. MK Land believes its concept of green, clean lush living areas will be able to woo more buyers and investors into that location, particularly expatriates. Damansara Perdana is a mixed development comprising commercial and residential properties on a 750-acre integrated township that is destined to be a premier centre for business and living in what is currently known as PJ north. It is located adjacent to highly popular Mutiara Damansara, which is developed by the Boustead group. Over the years, the M K Land group has sold more than 40,000 housing units exceeding RM5bil, including properties in Damansara Perdana. SP SETIA Bhd will launch 3,000 new homes in Precinct 6, 7 and 8 at its 1,000ha Setia Alam township in Shah Alam over the next two years. To date, it has launched about 7,000 homes in the three precincts, sprawled over 400ha, where 4,000 homes are occupied. Bandar Setia Alam Sdn Bhd general manager Tan Hon Lim said SP Setia has another 600ha to develop over the next seven to 10 years, which will cater to an additional 10,000-15,000 new homes and Setia City commercial hub. "We will continuously launch our terraced homes and semi-dees in various sizes to give purchasers a wide range of choice when considering buying a home in Setia Alam," Tan told Business Times. 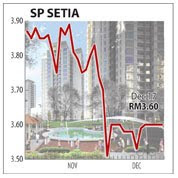 Tan said people are buying into SP Setia due to potential price appreciation and value. "Thanks to our 5/95 financing package, we sold around 1,000 units this year. We hope to sell the 3,000 homes that we plan to launch, in two or three years. So, next year will be more challenging for us than 2009," Tan said. Tan said Setia Alam homes have evolved into more modern designs for some phases, incorporating more friendly features with emphasis on security. Setia Alam, previously known as the North Hummock Estate, was started in April 2004. SP Setia bought 1,600ha of the estate in 2002. It sold 274ha to the Selangor Development Corp (PKNS) and allocated 316.4 for the development of Setia Eco Park. SP Setia, the Employees Provident Fund and Great Eastern respectively hold 50 per cent, 34 per cent and 16 per cent of Setia Eco Park, which is focused on selling land, bungalows and semi-dees. Tan said Setia Alam has potential to generate a gross development value of RM8 billion, which is excluding the Setia City commercial hub. Since the launch of Setia Alam, SP Setia has sold around RM2 billion worth of properties, including terraced houses and semi-dees. To boost sales, SP Setia constructed the Meru/Setia Alam Link for RM150 million with direct access to the New Klang Valley Expressway (NKVE). Emphasis on property management and maintenance is expected to lift the property care services industry going forward. Property care services is relatively small in Malaysia but it is a growing sector as owners and tenants put more emphasis on property management and maintenance. Property Care Services (PCS) International managing director Arnaud Bialecki says property maintenance adds value to a property, particularly for commercial buildings like shopping complexes, office buildings and hotels. “Owners or companies will be able to collect better rental with high quality properties, which can be done through property care services,” he tells StarBizWeek in an interview recently. An associate company of OCS Group UK, PCS is a privately owned company offering a full range of property support services with over 100 years of experience. Property Care Services (M) Sdn Bhd has been in Malaysia since 1997, with its base in Kuala Lumpur and branches in Penang and Johor. It currently has 400 staff in Malaysia with plans to increase this by another 600 in five years. It has more than 60,000 employees worldwide. It is more established in Thailand with about 3,000 related companies and a staff strength of 23,000. In terms of revenue, it is expected to chalk up earnings of RM375mil from its Thailand operations this year compared with Malaysia’s RM7.5mil, with an expected annual growth of 10%. PCS has established operations in several countries throughout the region such as Cambodia, Bangladesh, India, Austraila and New Zealand. The company provides integrated property support services, which includes cleaning, washroom and hygiene, pest management and gardening services. On the Malaysian operations, the company is currently seeking business opportunities with five-star hotels and Grade a buildings. It currently holds a 45% market share in property care services in the local retail market. Besides its operations in the Klang Valley, PCS is also seeking to expand its business into Sabah and Sarawak in the next two to three years. The company sees potential for Malaysia to become a major marekt and revenue earner for the group in the future. “We see opportunity in the tourism industry as new hotels are being set up in East Malaysia, which includes large hotel chains from overseas,” he says. He says the company also plans to acquire companies in similar business activities in Malaysia, Singapore and the Middle East. It plans to venture into Vietnam next year. On how PCS differentiates itself from its competitors, Bialecki says the company uses a lot of technology, supervision and training. “We invest in technology and equipment and put a lot of emphasis on staff training using the standards of the British Institute of Cleaning Science,” he says. On challenges in the property care services industry, Bialecki says human capital is a major problem globally as this is not a glamorous industry. It is, therefore, hard to retain and recruit people. The percentage of employee turnover for the company in Malaysia is 4%. Other challenges include the local climate and environmental conditions. “With monsoons, heat and dust, not to mention pollution, it is necessary to take a specialised approach to the professional maintenance of buildings,” he says. On local market outlook, he says as more buildings are developed, there will be a need for such services. “However, the market might feel the impact of the economic downturn in 2011 and 2012 as there are less projects being launched since last year. We see a pick-up today and this bodes well for companies like ours,” says Bialecki. Moving away from the Klang Valley, he says the various projects around the country like the economic corridors would favour property care companies like PCS. “Our priority in the next few years is to get market share away for our competitors,” he says. The company’s client base includes BMW, Suria KLCC, Star Hill Shopping Centre, Menara Citibank, YTL Residence and Royal Lake Club. CHM Hotels Sdn Bhd expects the meeting, incentive, conventions, and exhibitions (MICE), and the corporate markets to generate 70% of the collective annual revenue of the hotels under its management in the country in 2010. CHM’s managing director Datuk Eric Lim told StarBizWeek that the CHM chain of hotels has to date secured 10% to 15% more bookings from the MICE and corporate segment for 2010 compared to 2009. “For this year, the MICE and corporate market generated about 60% of our collective revenue of our hotels in the country,” he says. Lim said between 2008 and 2009 some of the hotels under CHM spent RM108mil on renovations and upgrading, which helped boost bookings from the MICE and corporate market. MiCasa All Suite Hotel in Kuala Lumpur, for example, reopened on Dec 9 after spending RM85mil on renovation works. The Boulevard Hotel in Kuala Lumpur and the Cititel Hotel in Penang also spent RM5mil and RM8mil respectively on upgrading works. “We have also embarked on a cross-promotional programme with Pangkor Island Beach Resort, another CHM managed hotel, to market George Town’s heritage status and Pangkor Island beaches. “This strategy has also helped to increase bookings from the MICE and corporate segment,” Lim says. On the forthcoming RM100mil Cititel Express in Penang, Lim says construction work for the four star 28-storey hotel should start in the first quarter. “The plan is for Cititel Express in Penang to have over 500 rooms, scheduled for completion in the second quarter of 2012,” he says. CHM presently manages The Gardens Hotel & Residences, Kuala Lumpur, The Boulevard Hotel, Kuala Lumpur, Pangkor Island Beach Resort, Cititel Penang, Cititel Mid Valley, Kuala Lumpur, Cititel Espress Kuala Lumpur, Cititel Express Kota Kinabalu, and MiCasa All Suite Hotel, Kuala Lumpur. SignatureKitchen cabinets may be finding their way into more homes, including of first-time house buyers and young executives, when the manufacturer, Signature International Bhd, launches its kitchen system brand, called Kubiq. If previously, Signature's kitchen fittings were more likely to be found in upmarket condominiums and residences, the availability of a more affordable range could open up a broader market for the manufacturer. Customers will not have to travel far to visit a Kubiq showroom either as Signature plans to open up to 100 outlets nationwide through franchising. Sharing the company's latest plans with Business Times, managing director Tan Kee Choong said that Kubiq features a new concept in the furniture industry here by involving customers in the design of kitchen fittings for their homes. "It is like a no-frills kitchen cabinet system because customers only pay for what they want. Customers pick and choose the products from the showroom and decide how much to spend," he said, when met after the company's annual general meeting in Petaling Jaya, Selangor, on Thursday. Through its business model, Signature can control inventory and pass on the savings arising from economies of scale in the form of competitive product pricing, Tan said. "This is part of our long-term plans to nurture the first-generation Signature customers. Kubiq enables customers to get SignatureKitchen cabinet systems at entry level and when they upgrade their lifestyle, they can purchase the systems that are more trendy and offer greater choice." Tan said that Signature had a soft launch of Kubiq early this month and that seven out of 10 invited customers had already placed their orders. The customers, mostly young executives aged between 25 and 35, ordered Kubiq fittings priced as low as RM2,000 an item. Tan also said that the company will identify suitable franchisees for Kubiq in the first quarter of next year, expressing optimism that the 100 outlets may be realised as early as in two years. For now, the group's major revenue contributor will continue to be the kitchen fittings that it undertakes for residential projects.